You must feel the Force around you, here, between you, me, the tree, the rock, everywhere!” Proud to present the Yoda Legendary Scale Figure, Sideshow is. The Jedi Master Yoda has been rendered in astonishing detail with this new half scale collectible inspired by his appearance in Star Wars: The Empire Strikes Back. 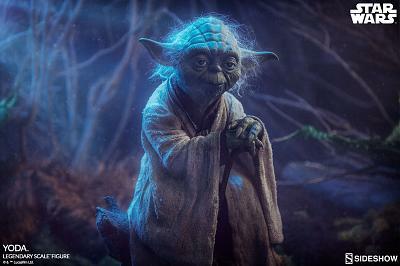 Yoda measures 18” tall, resting on a tree branch on a Dagobah-themed environment base. The Yoda Legendary Scale Figure has a custom-tailored fabric costume detailed with weathering, and his blissl instrument is hung around his neck. Yoda has a contemplative, peaceful expression on his detailed and wrinkled portrait, complete with synthetic hair elements. Continue your Jedi training and add the Yoda Legendary Scale Figure to your galaxy of Star Wars collectibles today.